While fighting game events allow everyone an opportunity to compete thanks to their traditional, open-bracket format, they have one explicit rule: you only get one shot at winning. 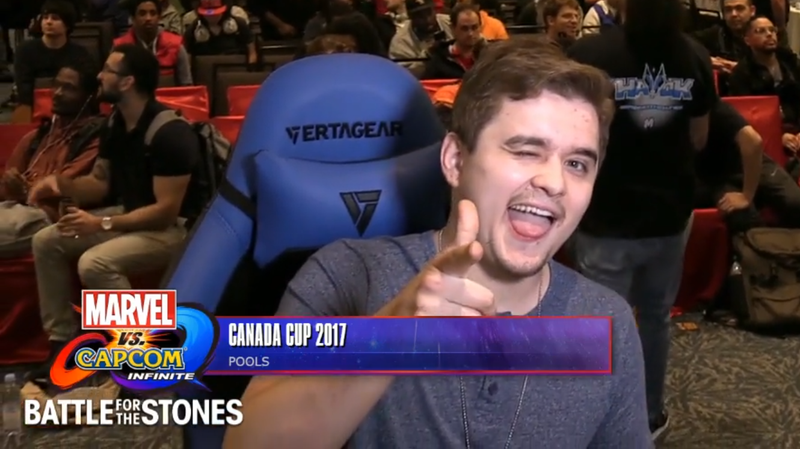 A competitor boldly broke this rule at this weekend’s Canada Cup in Toronto, Ontario when he decided his first chance wasn’t enough and participated under an assumed name in a different pool. His actions set off a chain reaction that affected the entire competition and left one player fuming after wasting $1,000 on making the trip to compete. Jose Aldape, who once competed as “Quackbot” but now goes by the name “PC Marvel God,” is known within the fighting game community as a strong Ultimate Marvel vs. Capcom 3 competitor thanks to his third-place finish at Evo 2017. Unfortunately, those skills have yet to transfer to Marvel vs. Capcom: Infinite in a significant way. Aldape’s progress through Canada Cup, the latest Battle for the Stones qualifying event, came to an end after just three games on Saturday morning, giving him the rest of the weekend to dwell on the disappointing 1-2 record that saw him eliminated from the tournament. But then something bizarre happened. Players at the venue noticed a familiar face as one of the later Infinite pools neared its conclusion, and realized Aldape had somehow reinserted himself into competition, playing under the name “Holy Order Troll.” According to fellow Marvel player Armando “Angelic” Mejia, who was the first to share details on Twitter for those not attending Canada Cup, Aldape was found out after beating Erik “Smooth Viper” Arroyo on stream (and pointing a smug finger gun at the camera for good measure). Capcom representatives and tournament organizers were quickly called over to handle the situation. A huge portion of the pool had already been completed at this point. Eliver “KillerKai” Ling, who made his first trip to Canada from Southern California to compete, was already qualified in winners, waiting on groups to wrap up so his first top 16 match could begin. With no official word from both Capcom and the Canada Cup organizers, it again fell on Mejia to relay information, announcing on Twitter that they were getting ready to replay the pool. As he had been matched up against Aldape earlier in the bracket, this meant Ling’s accomplishment was erased. With the impostor removed from competition, Ling played through his matches again and ended up being sent to the losers side of top 16 instead, where he dropped his next match and was eliminated from the tournament. He was less than happy with the results, sarcastically calling the situation “swell” after losing to a player he had previously defeated. Aldape’s cheating had cost him a good shot at winning the tournament and qualifying for the Battle for the Stones main event in December. With no word from official sources, the fighting game community was left confused as to what exactly happened. Why was Aldape playing under a completely different name? Did he register twice? Or was someone else involved? Compete reached out to Aldape and Crawford for further information as the accusations came to light, and both provided details similar to the former’s public statement. The Soul Stone’s powers of resurrection are only supposed to work in-game. Crawford’s bio on Twitter states that she is a 15-year veteran of the fighting game community. How neither she nor Aldape understood their actions would be a problem, on several levels, is still a mystery. Sneaky moves like giving someone your spot in the bracket were easier to hide or ignore when the scene was small, but the added spotlight of developer support means competitive integrity must be maintained at all costs. This incident, while relatively small, sowed chaos at Canada Cup and ruined the integrity of the entire Marvel vs. Capcom: Infinite event, overshadowing much of the day’s competition. Update, 11/02 - 3:03pm: Aldape and Crawford have been handed lifetime bans from Canada Cup events for their actions over the weekend, the organization announced this afternoon. Capcom has remained silent on if they will dole out additional punishments.